Shoe displays are the best way to attractively display retail footwear. And, surprisingly enough, there are a great deal of accessories and other features that relate to shoe displays. Displaying your merchandise in an attractive and effective way can make all the difference in the world for a retail shop owner. And, at Joslin Displays, we have everything concerning shoe displays that any prudent retail shop owner could want. Aside from our wide variety of shoe racks, we have shoe sizers, shoe benches & stools, plexi-gridwall shoe displays, shoe mirrors, single shoe risers, and much, much more. And it is important to both retail store owners and consumers alike to effectively use shoe displays in order to create an aesthetic appeal that will peak a customer’s interest. For example, if a shoe is displayed on one of our risers with a wood-stained base, that shoe will have a much more rustic and folksy look to it, while the same shoe displayed on a clear or metal shoe riser will give off a more modern look to the consumer. 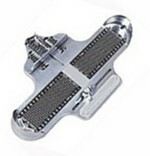 We also have decorative shoe displays like our scroll design shoe risers and our bent stem design shoe risers. Both shoe displays work in their own way to attractively display shoes. Our scroll design shoe risers make a shoe look as if it were a, “featured,” item; placing a great deal of aesthetic emphasis and importance on the shoe. 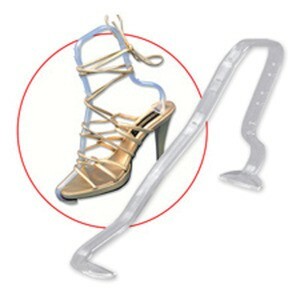 These work best when you’re displaying a new style of shoe or shoes that you have on sale. Either way, both designs can make any shoe standout from the rest. The ways you utilize these shoe displays are entirely up to you. Like all of our retail store fixtures, our shoe displays greatly lend themselves to the creative side of any retail store owner. You can use them to display a great deal of shoes or to prominently feature just one style of shoe. Combined with lighting and your store’s overall show room design, our shoe displays and accessories can greatly improve the overall look and feel of your store.